Trim the greens off the carrots, leaving 1 inch remaining. Peel the carrots. Melt the butter in a large saucepan over medium-low heat. Add the sugar and cook until dissolved into the butter. Add the water and stir. Increase heat to bring to a boil, reduce to a simmer. Add the carrots to the glaze and stir to evenly coat. Cook carrots in the glaze for 15 to 20 minutes or until carrots reach desired tenderness. Turn carrots several times during simmering to cook evenly. 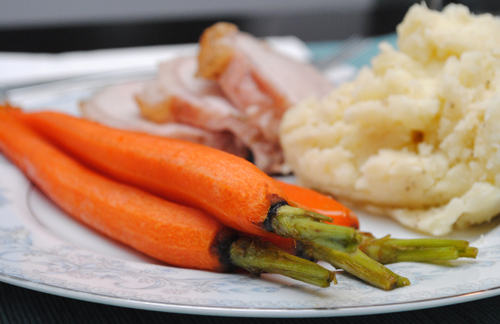 Serve whole carrots warm as a side dish.